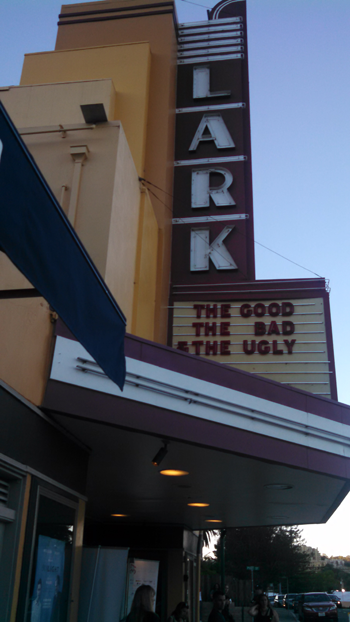 Wednesday night I finally got to a 2014 Mill Valley Film Festival event–a screening at the Lark of one of my favorite westerns, The Good, the Bad and the Ugly. Believe it or not, this was my first visit to the Lark. Yes, I’ve been covering it at Bayflicks for years, but this was the first time I actually stepped inside. The Lark is a modest-sized neighborhood theater of the sort that dotted the small towns and suburbs before the invention of the multiplex. The art deco décor has been lovingly restored. The lobby is small, with two small areas off to the side where people can sit and talk. The screen isn’t huge, but it’s big enough to create a real movie feel. The seats are comfortable, with good drink holders. Before the movie, Festival Executive Director Mark Fishkin came onstage and introduced James Hetfield of Metallica, who hosted the screening. Metallica is this year’s Artists in Residence, and each member of the band got to select a favorite film to be screened. Hetfield talked briefly about The Good, the Bad, and the Ugly, and how it had influenced him. He discussed the three main characters, the use of close-ups, and–not surprisingly–Ennio Morricone’s iconic score. The film started at about 7:15. The Good, the Bad, and the Ugly is an epic quest motivated purely by greed. Three violent and deadly criminals, all very skilled at their job, set out to recover $200,000 in stolen gold. None of them knows exactly where the loot is hidden, but individually each has a piece of the puzzle. They constantly change allegiances, sometimes collaborating with and then double-crossing each other. Meanwhile, war rages around them. Director/co-writer Sergio Leone set this western in the American Civil War. Issues like succession and slavery never comes up, but the destruction is vast and senseless. As the rebel army retreats from a town, an innkeeper loudly hails the Confederacy, while privately telling his wife that the Yanks will be better because they pay in gold. Another town has been battered to ruins–perhaps an echo of Leone’s adolescence in World War II Italy. Twice a day, armies clash over a bridge that both sides want and no one can hold. Soldiers on both sides speak with sarcastic hate of their commanders. And through it all, our three lead characters (I can’t quite call them all protagonists) cheat, threaten, bribe, and murder their way to their ultimate goal. The Good: Clint Eastwood plays his iconic Man With No Name, although in this film his friends call him Blondie. He’s a thief and a con artist, a quick and deadly draw who feels no remorse after killing someone. When he tires of his partner, he leaves him in the middle of the desert without horse, food, or drink. In any other movie, he’d be the villain. But he doesn’t kill without reason, and he occasionally displays acts of generosity to minor characters. By this film’s standards, that makes him the good guy. The Bad: Lee Van Cleef’s Angel Eyes stands amongst the vilest villains in film history. His nickname is clearly ironic–his eyes look as evil as Satan. He tortures people for information, robs prisoners, and murders with the slightest of motives. His only code of honor: If he takes the money, he sees the job through. Early on, he kills two men because each of them paid him to kill the other one–and he shoots one of them in cold blood. 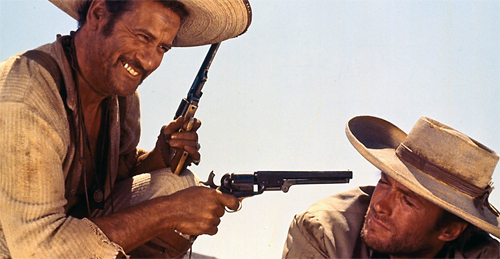 The Ugly: The Jewish-American actor Eli Wallach played Mexican banditos in at least three movies, but only here did he make the character funny, touching, lovable, and utterly horrible. His Tuco–devious, dumb, proud, and as wily as a rat–carries The Good, the Bad, and the Ugly. When he’s out for vengeance, his cruelty surpasses Angel Eyes. But when he needs the victim of that cruelty, he becomes the dependable partner–just so long as you don’t turn your back. More than anything else, Wallach’s performance raises this movie from very good to great. Leone and his collaborators tell the story of these men in a flashy and daring style. In addition to the close-ups and musical score I’ve already discussed, there’s the striking use of the widescreen frame, splashy editing–especially in the climatic three-way gun duel–and the dark humor that pervades the picture. The Good, the Bad, and the Ugly is an Italian film with American stars, shot in Spain, and set in the American west. Like most Italian films of its day, it was shot without recording a dialog track. All of the dialog was dubbed in separate Italian and English versions (and other languages too, I assume). Leone’s original cut ran 175 minutes–too long for the American distributor, United Artists. So Leone cut it back to 161. The cuts were made before the English dubbing; the removed scenes could not easily to restored to the film. That was fixed in 2003, when MGM/UA created the Extended English Language version. They restored and redubbed the cut scenes. Eastman and Wallach dubbed their parts, but another voice actor talked for the late Van Cleef. They also added a scene that Leone had cut from the Italian version, bringing the running time to 179 minutes. They also remixed the soundtrack, taking it from mono to Dolby Digital 5.1. So the film has now grown by 18 minutes from the version I first fell in love with. I have mixed feelings about the changes, and I still cling to my 161-minute DVD. Some of the recovered scenes add atmosphere and character development. Others fill in plot gaps that never really needed to be filled. I love both versions, but I love the shorter one more. This year, MGM/UA gave this picture a 4K digital restoration. They stuck to the 179 extended version, and–I’m glad to say–they restored the mono soundtrack. The festival screened the film from a 4K DCP, with the mono sound. Aside from a rather ridiculous MGM 90th Anniversary trailer (see MGM 90th Anniversary…without MGM), it was a great presentation, showing the deep colors and heavy grain expected in a Techniscope production of the 1960s. Unless there’s an archival dye-transfer print from the original release somewhere, this is as good as the picture can get. Overall, a very good evening.